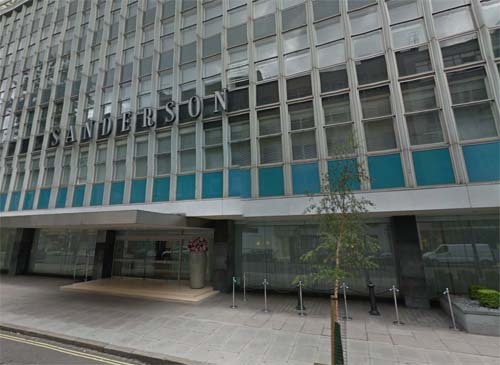 Berners Street is a street in London, where today on number 50 is the Sanderson Hotel. 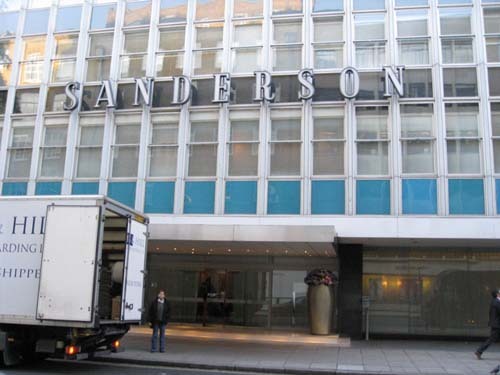 The Sanderson Hotel was constructed on Berners Street, London during 1958 as the new headquarters and showroom for Arthur Sanderson and Sons, manufacturers of wallpaper, fabrics and paint for its centennial. 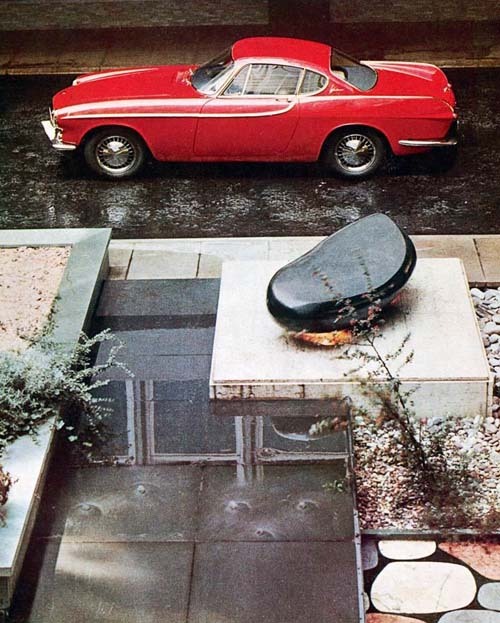 It was designed by architect Jeff Holroyd, of the architectural firm, Slater and Uren. The original design allowed for dynamic room configurations. 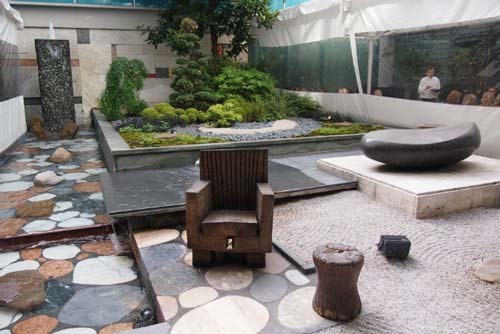 The building plan was fabricated around an open-to-the-sky inner courtyard with a Japanese garden designed by Philip Hicks. In 1991, the Sanderson building was listed Grade II* by the government’s English Heritage Commission. 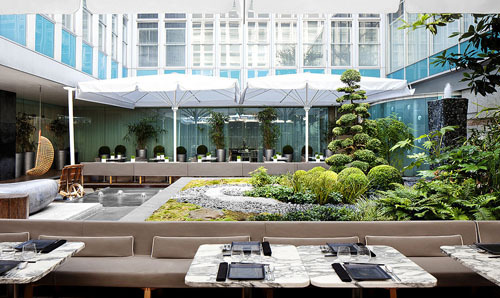 It was reopened on April 25, 2000 by Morgans Hotel Group after refurbishment by Philippe Starck and Denton Corker Marshall. Originally the main entrance featured both lifts/elevators and a grand staircase which ascended against a huge stained glass mural masking the lift shafts. The first floor was devoted to wallpaper displays and its lengthy retail counter allowed for conversion to a long bar. The second floor was reserved for fabric displays, while the third floor held management offices and an interior design studio. In each room, above the bed, there’s a painting bolted to the ceiling. 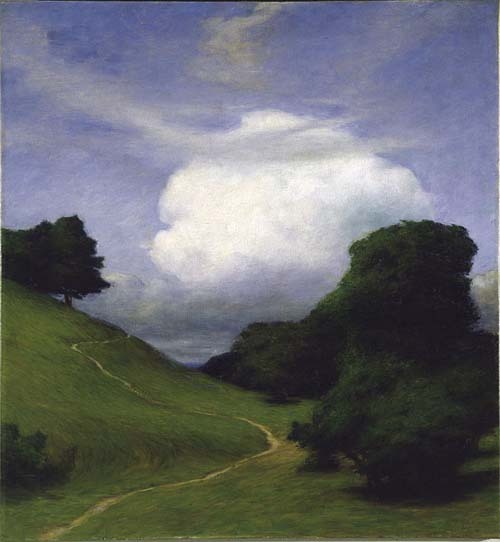 The painting is a reproduction of “The Cloud” by Swedish painter, Prince Eugen. The original dates back to 1895. Today, the hotel is famous for its afternoon tea parties. In keeping with the surreal atmosphere, Sanderson have created a Mad Hatter’s Afternoon Tea, and guests are invited to “tumble down the rabbit hole” and enjoy the wonderful world of tea in the beautiful Courtyard Garden. Upon being seated, guests will receive a menu, hidden inside a vintage book, and linen napkins wrapped with a riddle, thereby beginning the theatrical afternoon. Each tea blend is presented at the table so guests can sample the aroma of every variety from miniature glass caddies. Tea can be sweetened from a magical music box containing a ballerina dancing on top of the sugar, which will serenade guests to the tune of “Somewhere Over The Rainbow” once opened. 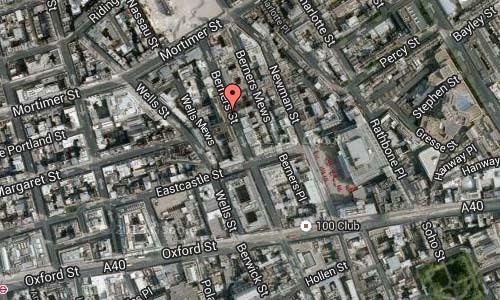 The hotel occupies the site of 54 Berners Street, known for the Berners Street Hoax of 1809. The Berners Street Hoax was perpetrated by Theodore Hook in the City of Westminster, London, in 1810. Hook had made a bet with his friend, Samuel Beazley, that he could transform any house in London into the most talked-about address in a week, which he achieved by sending out thousands of letters in the name of Mrs Tottenham, who lived at 54 Berners Street, requesting deliveries, visitors, and assistance. Despite a “fervent hue and cry” to find the perpetrator, Hook managed to evade detection, although many of those who knew him suspected him of being responsible. It was reported that he felt it prudent to be “laid up for a week or two” before embarking on a tour of the country, supposedly to convalesce. 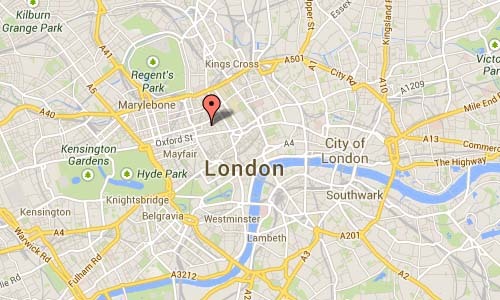 The address of the Sanderson Hotel: 50 Berners St, London W1T 3NG, UK. More information on sandersonlondon.com, www.museumofhoaxes.com, www.bookatable.com and en.wikipedia.org.